The French Grand Prix at Reims was all about the long-awaited return of Mercedes, and it was worth the wait. The streamlined bodywork and space frame chassis of the W196 made its rivals look like oversized Dinky toys, even the legendary Maserati 250F looked inferior next to it. New fuel injection technology was taken from Mercedes' 300 SL sportscar and used to produce a high-revving , straight-eight engine pushing out an impressive 257bhp, roughly 30bhp more than the 250F's straight-six. On the long straights of Reims it dominated, with No. 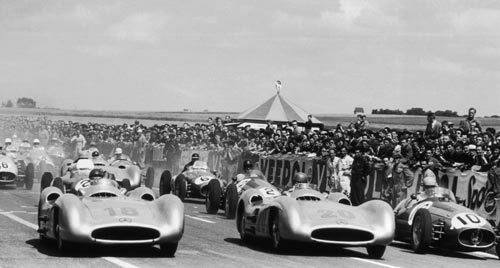 1 driver Juan Manuel Fangio recording an average speed of 118.6 mph on his way to victory by one second from team-mate Karl Kling. The whole operation was on a different level and contemporary race reports said the Mercedes duo "looked as if they were on a demonstration run". The Daily Express resorted to using military metaphors to describe the ruthless efficiency on display in the pits ahead of the race. "The Mercedes team was run from the pits today with fantastic discipline and organisation," it said. "Under manager Dr. Alfred Neubauer, mechanics and drivers worked like a military unit. Up to the last minute, when the 23 cars roared away from the starting grid, the Mercedes pits sounded like an army barracks as order after order was snapped out and obeyed at the double." The other cars were left chasing in vain. Alberto Ascari, who had so dominated, was now on the receiving end in his borrowed Ferrari, and along with José Froilán González and Mike Hawthorn, their Ferrari engines blew as they strained to keep up. The only Ferrari to survive was that of France's Robert Manzon, who finished third ahead of Bira, Villoresi and Behra. The rest of the field all retired. Stirling Moss came home third to score the first of many points in his career. Mercedes had returned to Formula 1 in the most spectacular of fashions.